Lately, more and more car shares have popped up around Vancouver. I am a member of two, and have had exposure early on in the car sharing game via my friend who introduced Modo to me back in 2010. So I thought everyone might benefit from a guide on my experience, as well as take a look at the different car shares in Vancouver. If this is a bit too long for you, scroll down to see the summary chart— keep in mind that the chart is based off the cheapest memberships available from each car share, but Modo and Zipcar offers other kinds of packages as well. Generally, I’ve had a good experience with car shares. There’s late nights when taking public transit is just not an option, and taxis might deem your trip too close to be worth their effort. There are also places that aren’t as easy to get to with public transport. Take going to my boyfriend’s house: we live only about 20 blocks apart. Taking transit requires going on 2 different busses, and my commute time ends up being at least 20 minutes-30 minutes if the bus schedules didn’t line up. If I pick up a car share car, my trip to my boyfriend’s is 5 minutes. I can’t afford my own car, and I don’t have a need for one at the moment. UBC is a bus away, and so is downtown. I get access to the family car on the weekends. But having the option to drive whenever I want is handy. One thing to note is that I joined car2go and Evo for free because they were having promotions for free registration for university students. I was a car2go member since 2013, and an Evo member since the summer of this year, 2015. I’m not sponsored in any way for this post. Hopefully this post can help those of you considering car share figure out which one is right for you, and point out some things you might want to take note of. Back when my friend told me about Modo, I was intrigued. When we went on longer trips to the US, he’d usually reserve a Modo minivan and then we’d pile all our things in and go. So simple! Of course, the two day total for the car was about $200 (unless if my memory is failing me), but shared amongst several people it’s not that bad. One thing I saw a flaw in was returning the Modo car— which is the same for Zipcars: you have to return the car where you got it. There are designated spots around Vancouver for Modo cars. You have to return it there. It’s not as handy as I’d like it because it’d mean I’d have to allocate more time to return the car, and unless if there was a designated vehicle near my house, it’s not very convenient. That’s why when car2go came out I joined when I managed to find free membership. 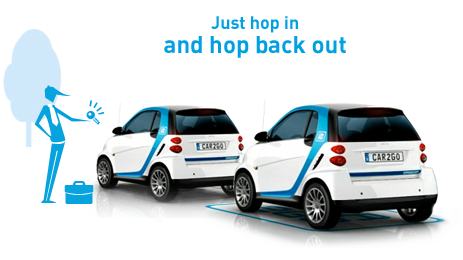 Car2go has a home zone area, and you’re free to drop off the car anywhere within that area. That meant I could park in front of my house and leave the car there. That also meant I can drive it to a friend’s house and leave it there, and then bus back if I wanted to. Or vice versa. Evo also does the same, but right now their home zone is smaller than car2go’s. For example, I can drive to Richmond as long as it’s along no. 3 road and park anywhere there for a car2go! TLDR: Make sure you’re okay with the method that you must return your car share vehicle. If Modo/Zipcar doesn’t have a vehicle located near you, you may want to reconsider paying for a membership. I don’t have experience renting a car share vehicle for an extended period other than indirectly with friends for Modo. But if you look at the chart I’ve included, although it’s easier to drop off and pick up car2gos and Evos, Modos and Zipcars may be cheaper if you’re looking at extended and more frequent rentals. I’ve driven from UBC to home and that took about 45 minutes, and my bill came to almost $20 for a ride home. Ouch. You can see that Modo’s hourly rates are much lower, but keep in mind that you have to return that vehicle at the same place you got it. Chances are it may take a while, but for extended trips (such as multiple day rentals), you should look into Modo/Zipcar. 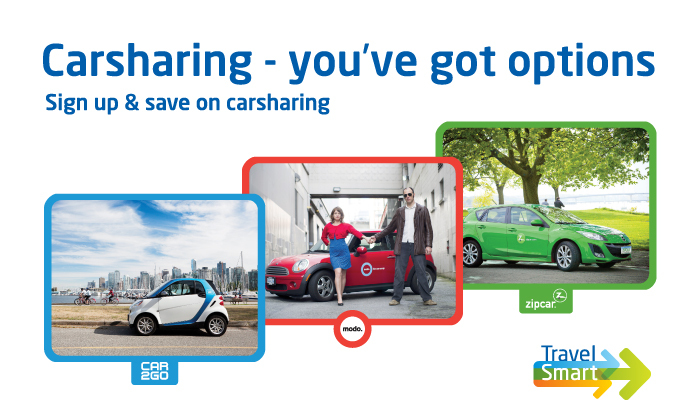 Modo and Zipcar have several different plans to choose from, whereas car2go and Evo has the same plan for everyone. Car2go and Evo has a yearly renewal fee of $2, but otherwise you’re good to go. Modo’s more expensive membership plans (a member-owner plan instead of just being a monthly member) costs $500 rather than the $10 sign up + $5 monthly fee I’ve listed below. But you’ll get to pay a lower fee for the hourly/daily rates. 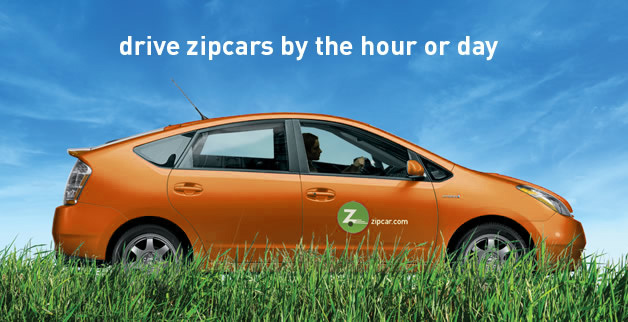 Zipcar also has different plans depending on how often you’ll need the car— if you need it less, the hourly rates are higher, but your membership commitment cost is lower. One thing I like for the car shares I’m a part of is the fact that they have parking spots downtown. I can drive downtown, drop them off and be done with that. Parking in downtown is a nightmare for personal vehicles, so this is a big plus for me. One great thing about car shares is that gas is included. If your vehicle is low on gas, there should be a credit card (locked to only gassing up for that vehicle at gas stations) in the car which you can use and it’ll be charged to the respective car share provider. Insurance is also included in your membership fee. For Evo and car2go, you rate the cleanliness of your car and I think when enough people deem a car to be dirty, they’ll send someone to clean up and wash that car. For Modo, one of the best things my friends and I would do is take the car to an automatic car wash. It’s basically like a carnival ride, and best of all, it’s free! Well, Modo will pay for it since if you have the time to take their car for a wash, they’re more than happy to reimburse you for that. One thing to note is that car2go recently (since June 1st, 2015) started charging an extra $1 every time you start up a car for a rental. It has something to do with lowering each member’s deductible. They say that after 91+ trips, this fee becomes $0, but honestly I don’t think I’ll reach 91 trips. So now I just try picking up an Evo if one’s available nearby. What car do I get? 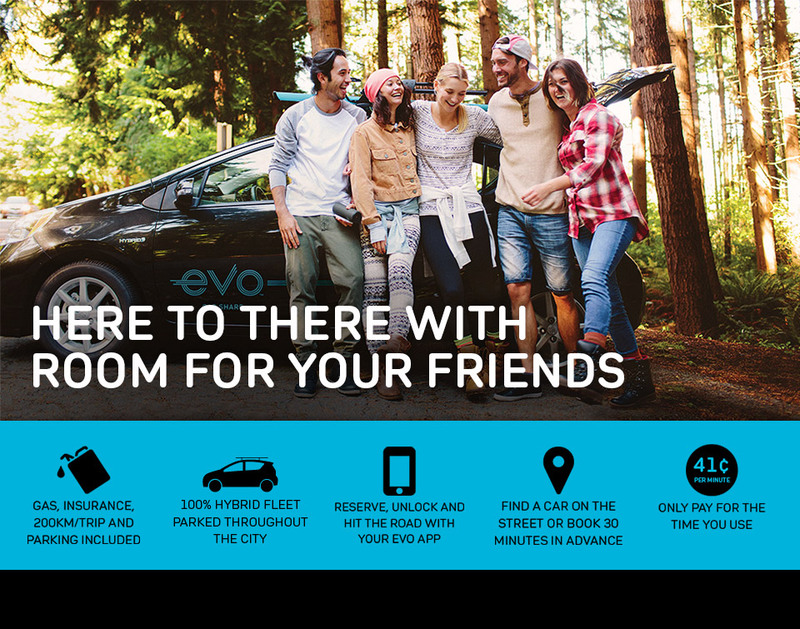 Evos advertise themselves as a car that you can take 4 friends with you on outdoor excursions (a Toyota Prius Hybrid). That was a big benefit over car2gos, since they used to be an exclusively smart car fleet. Now they’ve added a few (mind you not a lot. As of the time of this post, it’s at 25) Mercedes-Benz B-class vehicles that can fit five people in total to even out the game. Modo and Zipcars have a wide variety of vehicles. As I said, we’ve rented from Modo a Prius, one of those gross looking square-ish cars (a Nissan cube? ), minivans, regular economy cars— you name it. Zipcars also has a variety of cars in their arsenal, but different cars have different hourly rates attached to them, unlike Modo’s flat fee for all their cars. I’m no expert at car shares, and most of my info on Zipcar I Googled to compare since I’ve never used them. I did have an offer at my workplace to get a Zipcar membership for cheaper, but it didn’t compare to the free memberships I got through my university promos. Plus their yearly fee is way more expensive than the $2 I pay for my current car shares. I first started with car2go, happy that I was able to rent a car despite not being 19+ years old. As long as I had driven for 3 years (including my learner license years), they were cool with having me on board. Since then, it’s nice to have the option to drive if I have to. Hopefully the below chart shows more of a side-by-side comparison for you and summarizes things a bit! You’ve been doing this a while. It seems like a great concept. Owning a car is freaking expensive. Even if you are given a car you will still likely pay $4000 a year just for gas, insurance and maintenance. I sometimes see the car2go cars parked on Broadway between 3-6pm when there is no parking allowed…lol. I’m not sure if they get towed. I don’t think that’s allowed but if the sign for a street says max 2 hours, you’re allowed to end your trip there and park there forever. Lol yeah if they get towed, whoever parked it there gets the fine.